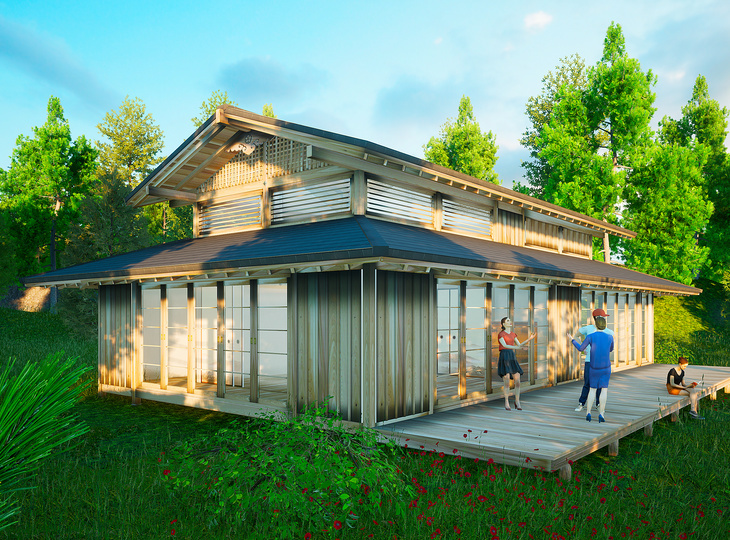 The Japanese themed prefab modular Furi Damu pavilion is the second largest building of a range of exclusively designed and manufactured garden houses, pavilions and bungalows by Yokoso Japanese Gardens. The Furi Damu Pavilion (Japanese for freedom) is really making her name come true. 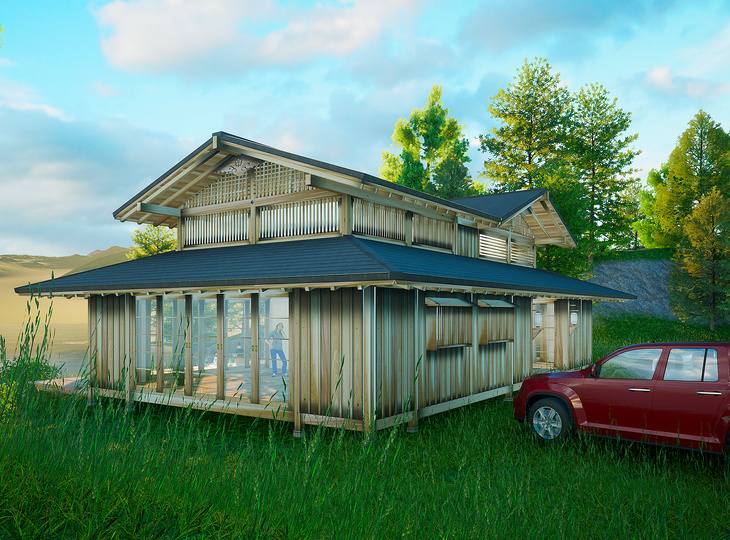 Because of the more then generous interior space of 1390 x 760 cm, this pavilion is the right choice if you are looking for a Japanese style bungalow or guest house. On request, seperation walls can be added to divided the available space into separate sections, for instance to create a bedroom, shower room, toilet and kitchen. By means of a smart wall system, fixed walls and walls with sliding doors can easily be exchanged to your wishes, to compose the most optimal configuration. 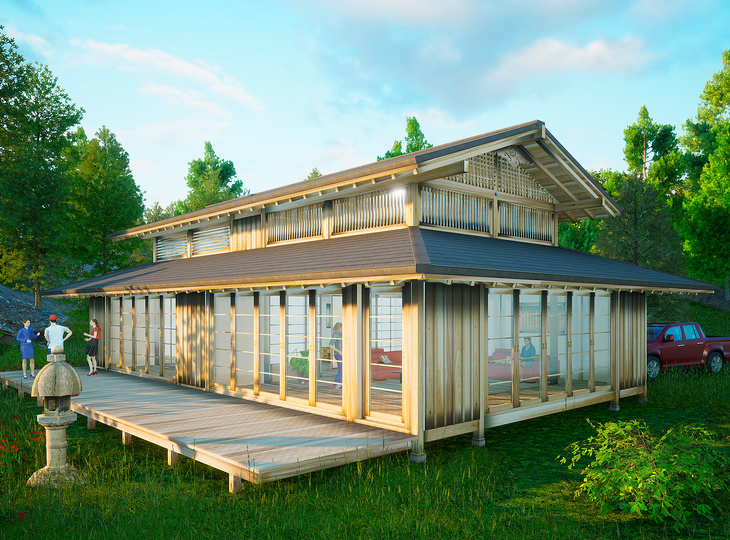 Of course the Japanese style Furi Damu pavilion can, equipped with a luxurious Jacuzzi, sauna or Japanese ofuro, be converted into the perfect wellness solution. 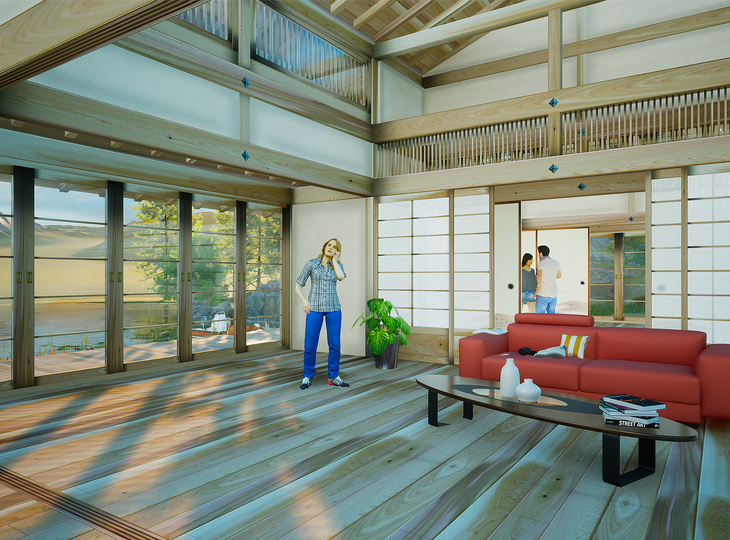 The Furi Damu bungalow can be fitted with shojii style (Japanese latticework) sliding doors which can optionally be installed at each side of the pavilion. If you choose a Furi Damu bungalow with a double roof, there is also the option to replace the wooden skylights with double insulated glazing. This option will result in even more natural light. Like the other prefab modular pavilions, garden houses and bungalows designed and built by Yokoso Japanese Gardens the Furi Damu pavilion is based on an ancient Japanese theme. 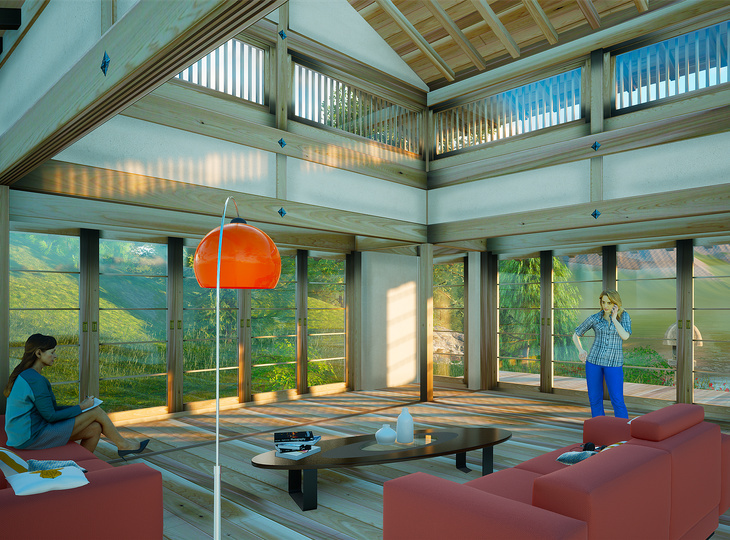 By means of a so-called "engawa" (type of balcony) around the core of the building the available living space can be extended and boundaries between interior and exterior spaces will dissolve. The typical overhanging roof ensures you will stay dry while you enjoy your pavilion and garden even when strong summer rains hammer the roof. Should you deploy the Furi Damu pavilion as a workshop or studio it should be simply to determined the optimal configuration and placement of the building, ensuring you always have enough natural light to be able to work with pleasure. And of course the pavilion is a great joy between working hours. 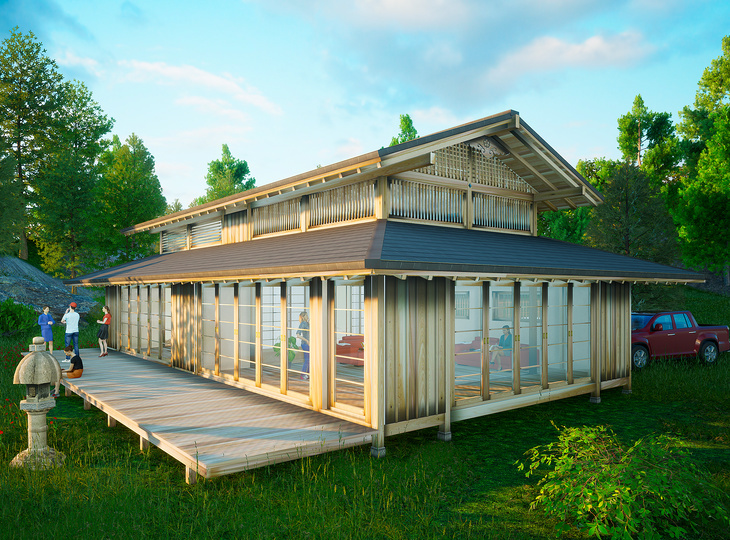 The Furi Damu pavilion is also perfectly usable as a multipurpose garden house with an Japanese touch. The options are endless, you are the director and anything goes. With the Furi Damu pavilion you are inviting a breeze of luxury and authentic Japanese atmosphere right into your life. 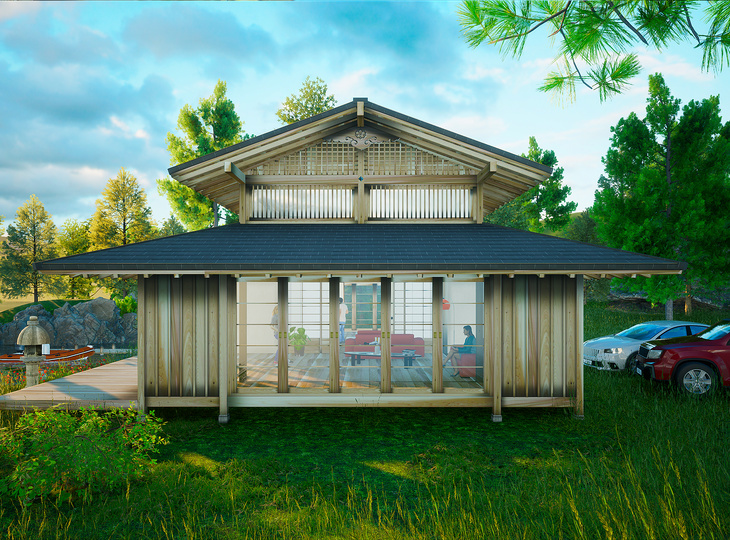 Our Japanese style pavilions, garden houses and bungalows are be build to order in various wood types and configurations. In standard configuration, all of our pavilions, garden houses and bungalows are fitted with traditional Japanese style ceramic rooftiles. However, we can also fit the roof with modern roof tiles or wooden shingles. Obviously Yokoso Japanese Gardens only uses certified materials of the highest quality. The Japanese style pavilion Furi Damu, (Japanese for freedom), is supplied as casco construction, built from only the very best materials. To be able to guarentee a high degree of authenticity and quality of the design and construction only traditional materials, jointing and techniques are used. All walls, roof and flooring of our country houses, garden houses and pavilions are double insulated. On request preparations for gas, water, electricity and sewerage can be build into the construction. Our country houses, garden houses and pavilions are provided as "shell". This means that no partitions or compartments have been made in the building. Obviously this can be adapted on request. Any windows, skylights and sliding doors are fit with double insulated glass. The inner core of the construction is "sitting" on a concrete foundation while the outer construction (engawa) is "standing" on stone supports. These supports consist of concrete molds that are placed under the lower part of the vertical posts at ground level covering the anchorage to the foundation and at the same time protecting the wooden beams from moistuire. 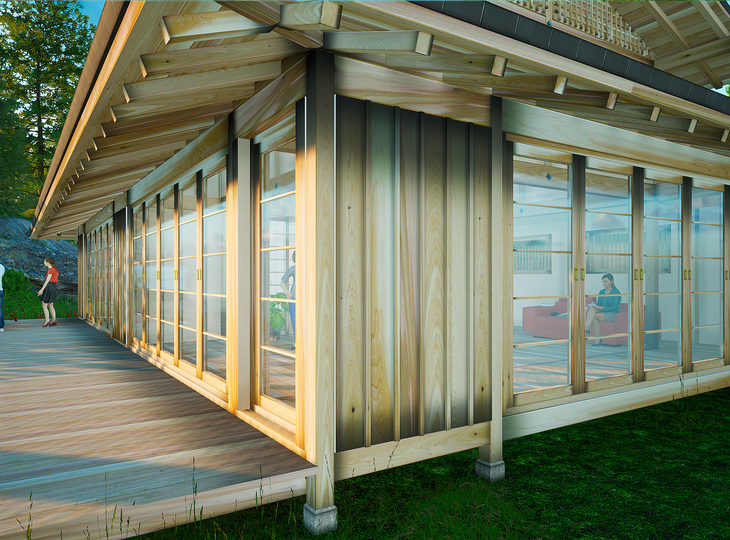 The Japanese style pavilion Furi Damu is a prefab modular design. The modules are 500 x 760 cm each and can be combined to expand the building. This way we are able to alter the floorplan and final shape to your needs. The Japanese style pavilion Furi Damu is made of natural wood. Natural wood will greatly determine the strong natural character of the building. The various wood types are treated in different ways so that the elements and insects like termites, beetle and woodworm will have no influence on the construction. Over time, however, a natural discoloration may occur. The wood will eventually turn grey which in no way will affect the quality of the wood. If you want to avoid this aging please be sure to treat the wood with a natural oil on regular basis. Yokoso Japanese Gardens builds country houses, garden houses and pavilions that will last for ages and will gain beauty over the years. 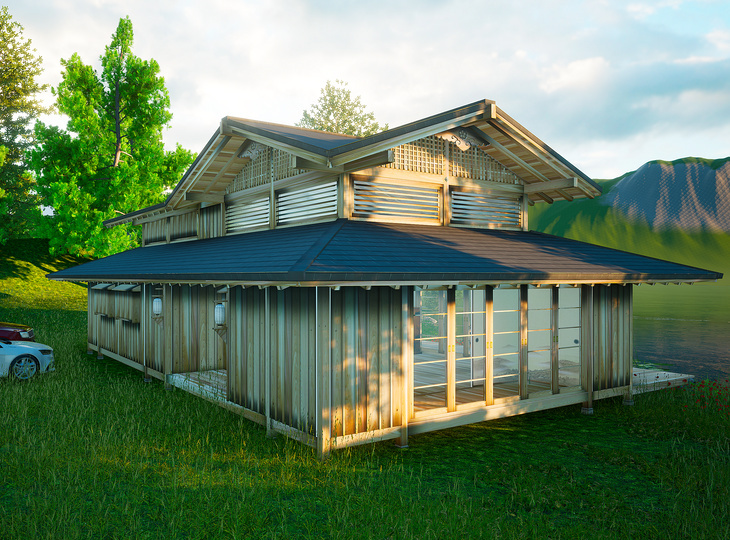 In short, your Japanese style pavilion Furi Damu will make a very good investment. The foundation for the The Japanese style pavilion Furi Damu should be determined depending on the location the building will be installed. Preparations for gas, water, electricity and sewer must be determined and finally constructed depending on the application and use of the building. Research into and implementation of facilities for gas, water, electricity and sewage in the foundation are not included in the base price of the building. In general you will need a permit from your local municipality to build a country house, garden house or pavilions on your property. Please inform yourself with an expert regarding the policy of your residence before proceding to order your Japanese style pavilion Furi Damu. More information and regulations on the placement of a building can be found on the website of your Ministry of Environment. • All country houses, pavilions and garden houses are built with prefab modular elements. • All elements can be fitted with a closed walls, sliding doors or double insulated glazing. • Seperation walls and Oriental shutters can be placed to devide the space into smaller rooms. 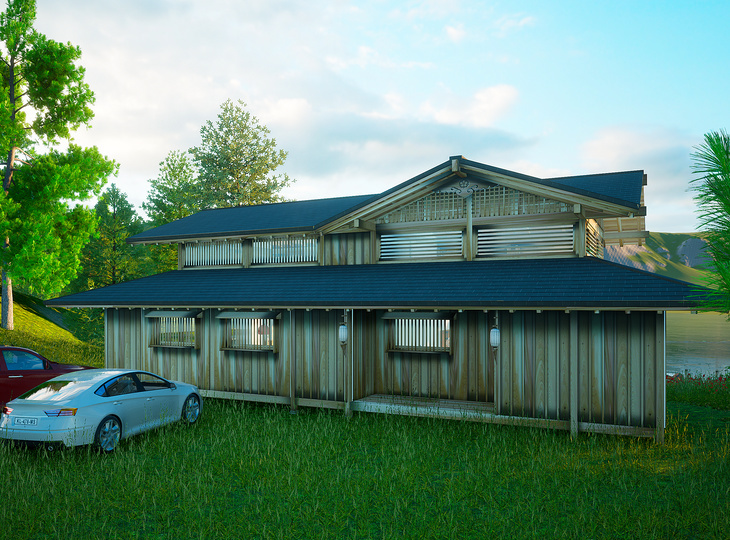 • All country houses and pavilions are build with Oregon Pine, Western Red Cedar and White Birch. • Roofs can be fitted with wooden shingles, traditional Japanese ceramics tiles, zinc or copper. • The wooden skylights can be replaced with double insulated glass panels. (double roof only). • We can also supply traditional tatami flooring in various thicknesses, colors and designs. • Other adjustments and configurations of the construction and dimensions on request.